Augmentative communication is a communication system that is used for individuals who have little to no verbal communication. It can be used for individuals who may be diagnosed with autism, apraxia, cerebral palsy, aphasia, or traumatic brain injury, among others. Augmentative communication is any method that supplements or replaces speech and/or writing to meet an individual’s personal communication needs. 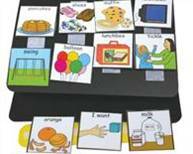 Use of an augmentative communication system is determined by a speech/language pathologist but may incorporate input from an occupational therapist, physical therapist, special education provider, etc. Once a system is determined, therapy consists of the set-up of the system/device and training for the individual as well as their caregivers. 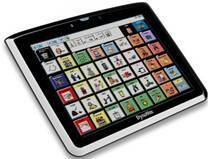 Augmentative communication systems vary from low-tech options to high-tech. Examples of low-tech systems can range from PECS (Picture Exchange Communication System), to eye gaze boards, to alphabet boards for spelling. High tech systems allow the storage of electronic messages and can range from simple static display devices (fixed symbol choices) to dynamic display devices (computer based devices, typically accessed by touch screens).